So I am working on some caricature studies of different celebrities/well-known persons. 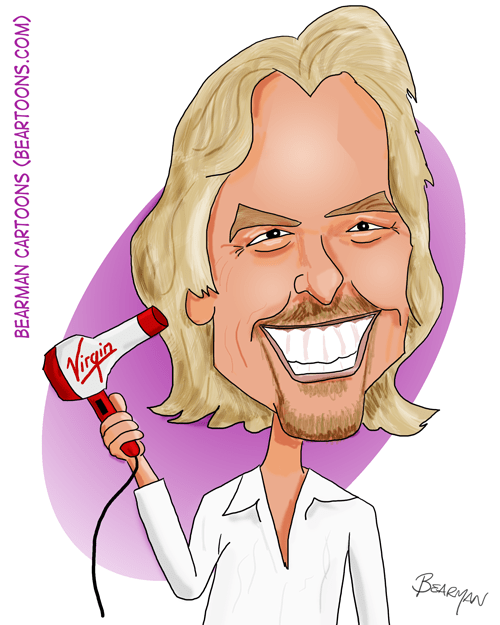 First up was Sir Richard Branson of Virgin fame. I hope when I am his age my hair looks half as good. Why hasn’t he put out Virgin hair care products? Any celebs you think it would be fun for me to tackle? Let me know in the comments. Jim Parsons (Sheldon Cooper of Big Bang theory). I hate to admit this, but I’ve not a clue who this person is. We are not television and movie people. You did a fabulous job though. I’d like to see your take on John Oliver, current guest host of The Daily Show. I think he’d caricature well. Not sure who he is but I’ll have to check him out. Sir Branson is an interesting businessman and big thinker. I guess if I had a fat wallet I could get attention for big ideas. I suggest you do Ellen DeGeneres dancing. What? and do legs I don’t do legs…oh wait, I did your legs. Oh, what an immaculate conception! Well done, Bearman! That really looks like Branson! You captures him well. The only celebrity I’d like to see you do is Bearman. Bearman or the man behind Bearman? I think I’d rather see Bearman than Bearman’s behind. Hold on there is someone behind me? Draw the real you 🙂 Of course if you reveal your secret identity then you may lose all your powers. Then he might have to live out his years in Wombania under the wine gum protection plan. How do you know I already don’t? You’re not Mr. X, are you? Have seeing the clip of Morning Joe I would say Russel Brand. I feel like his teeth are about to make that *ting* / glistening sound-effect. Be sure to note that in his bill. Great job on the likeness! So Steve Buscemi. I have no idea who is popular, but have you done Gandolfini already? It could be a posthumous thing. You aced this one, B. I knew who it was without even reading the title. The texture is phenomenal. Heck, I don’t even think Branson himself would have a problem with this depiction of his lustrous locks. Good work! totally agree George. No need to read the title at all. Great job on that caricature! I agree Bearman, his hair is awesome! Neil deGrasse Tyson and Neil Gaiman. You should have some fun with those two. NDT would be a good one. I’d like to see you tackle Steve Buscemi. No, literally tackle him. The thought of this makes me smile. Seriously, don’t think I’ve ever seen a good Buscemi. Ha! The tooth is in the pudding, or so they say. Me thinks we could go on for hours with this one. Excellent work. If Sir Richard had shared his care secrets years ago I may not be in my current follicular predicament. Just wanted to pop and say that you do really good work. And as for a suggestion, since someone suggested Jim Parsons, how ’bout Johnny Galecki? haha I had to look up who that was. I didn’t know his name.